In the history of Nigeria Banking, not a single Digital Bank has ever been created from the start. Banks only provide a Mobile Banking application, which tends to make transactions more faster. But the fact is Mobile Banking is different from Digital Banking. 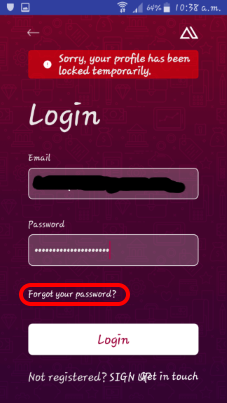 Mobile banking requires you going to your bank to get your ATM card and also get it activated, while your Virtual Card is being shipped to your door step and are activated by you and you alone which your pin can be set and controlled in Digital Banking. How will you feel when I inform you now that we have the FIRST of it's kind in Nigeria. 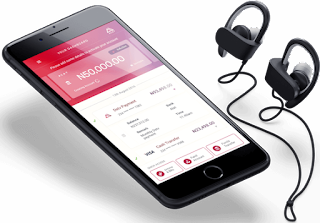 I will like to Introduce to you, the first Digital Bank in Nigeria, which is ALAT by Wema Bank. ALAT is a digital banking service powered by Wema Bank Nigeria, it is 100% digital which allows you to do all your banking transactions without being physically present at a bank. Alat digital bank allows you to open a free, fully functional savings account using just your BVN and phone number in exactly 5 minutes. No paperwork required! At its core, ALAT by Wema bank is selling simplicity, reliability and convenience. 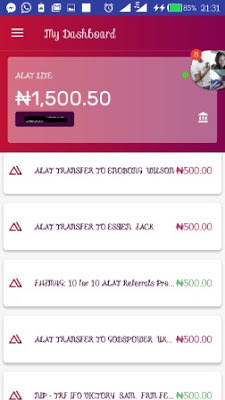 ALAT digital banking help you put money away easily by automating your saving, make sure your bills are paid on time with its scheduled payment feature and deliver a free debit card (ALAT ATM Card) to your doorstep, you can activate, lock and unlock from your phone to use anywhere in Nigeria. You can get paid when you refer a friend to open and fund an account too. All from the comfort of your smartphone. The question asked by most people is: Can we trust ALAT? This is becoming so interesting. After my tour of my research I found ALAT to be legit and trustworthy and also, it has a very responsive and caring customer care service, they are ready to listen to your complaints and also ready to get them solved as soon as possible. So why not try ALAT? 4. 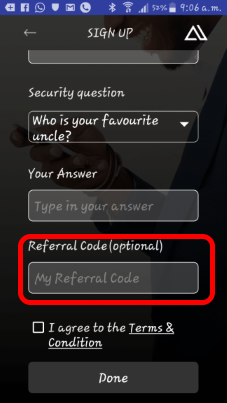 Then move on by clicking next, where your full name would be uploaded already and you will be told to fill in your Date Of birth and also A REFERRAL CODE. Copy this ALAEJL and paste in the referral section. 5. You will have to upload your documents and that involves your ID card, written of your signature in white paper with pen, taking a picture of yourself, and upload them. 7. 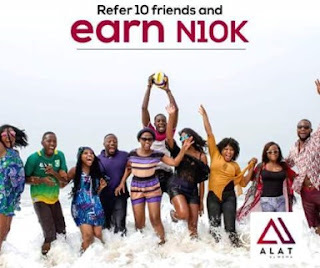 Refer anyone to open a ALAT Wema bank account with your own referral code which you will find when you click on "refer a friend" and you will earn up to 1000 Naira on each person. More also, for the first 10 people you referred, you will earn 5k and then will be given a bonus of 5k making it 10k. I hope you find this very interesting and easy. Open a bank account in less than 10 minutes and get your Virtual Card shipped to your doorstep in two business days. SHare this post with your friends and drop comment below.